TifDwarf bermudagrass has been one of the most popular choices for putting greens for more than 40 years. TifDwarf also is a popular turfgrass choice for bowling greens, tennis courts and croquet courts. This fine-bladed, dark green hybrid bermudagrass has good rooting capabilities and is relatively simple to manage. It performs well in high heat and heavy traffic. TifDwarf bermudagrass (a natural dwarf mutant of TifGreen) has many of the same characteristics of TifGreen. Its anthers are yellow and shed no pollen. Its stigmas, racemes, and panicles are smaller than those of TifGreen but otherwise are identical. TifDwarf has small and shorter leaves, stems and internodes and establishes slower than TifGreen when sprigged at the same rate. TifDwarf has a darker green color than TifGreen and requires less fertilizer to give a comparable degree of greenness. Its purple basic plant color that helps to keep it dark green in the summer becomes very noticeable when temperatures drop in the fall. As a consequence, TifDwarf takes on a purplish cast that is objectionable to many. TifDwarf will tolerate closer mowing and makes a faster putting green than TifGreen. 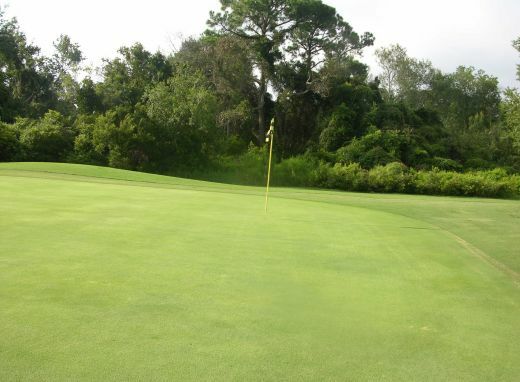 Its softer leaves and fewer seed heads also contribute to its superior putting qualities. Its ability to make a good turf under very close mowing has made TifDwarf a popular grass. TifDwarf was developed by the U.S. Department of Agriculture and the University of Georgia Coastal Plain Experiment Station and released in 1965. TifDwarf was developed by University of Georgia plant breeder and geneticist Dr. Glenn Burton at the Georgia Coastal Plain Experiment Station in Tifton. As a USDA patented variety, TifDwarf can only be sold as certified sod or sprigs and only by a licensed member of the Tift 94 Growers Association. It also is available for growing through the International Turfgrass Genetic Assurance Program (ITGAP).